I headed east from Twinstead, so the wind was behind me again (but how can a west wind be so bitter?) and had to choose between Lamarsh and Alphamstone next. Lamarsh made sense to do first, if I was planning to continue south, so I turned on to what my father-in-law calls 'the back road' from Sudbury to Bures and was very quickly surprised by the somewhat surreal apparition of Holy Innocents church. Open. A round-towered church, but the entire building is encased in a pleasing greenish-white render, and the top of the tower is surmounted by an elaborate octagonal spire with fairytale dormer windows, by Arthur Blomfield, an architect I don't usually warm to. The whole effect is of a bit broken off of a castle belonging to Mad Ludwig of Bavaria, which as you may imagine I liked very much. 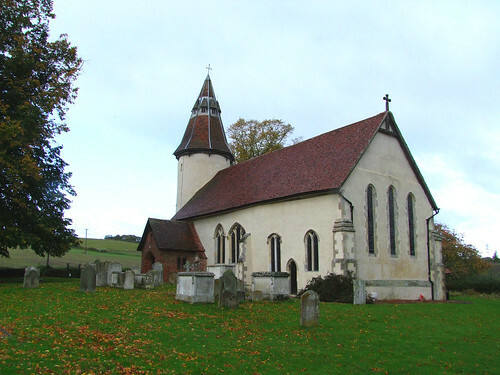 A sign on the door warns you that the church is alarmed from 2000h to 0700h each night - 'the church contains no valuables, but we alarm it to prevent damage caused by break-ins'. It adds, almost as an afterthought, that ' this village church is always open every day from 0700h to 2000h', obviously a relic of its anglo-catholic heyday. A big, wide, pleasing interior, perfect to set off the two great features. One is a long 15th Century roodscreen, beautifully elegant with bubbly tracery. It is stripped and varnished, so there is no surviving paint, but even so, it is lovely. And beyond it is a beautiful curiosity. The east window was three wide-spaced lancets, typical of Bloomfield. However, they have been filled with stunning Arts and Crafts Movement glass by Mary Lowndes, perhaps the leading female artist in any medium of the last years of the 19th and first years of the 20th centuries. She is best known today for her work for the suffragette movement - she designed their posters. These are huge, near-floor-to-ceiling lancets, but what makes them more remarkable is that she did not do them all in one go, coming back over a period of almost 20 years to do the three windows. They are so very good, and I immediately elected this church my favourite of the day so far.